June 17, 2012 -- Steve Torrence experienced one of his shortest working days in three months Sunday when he lost in the first round of Ford the Thunder Valley Nationals at Bristol Dragway. 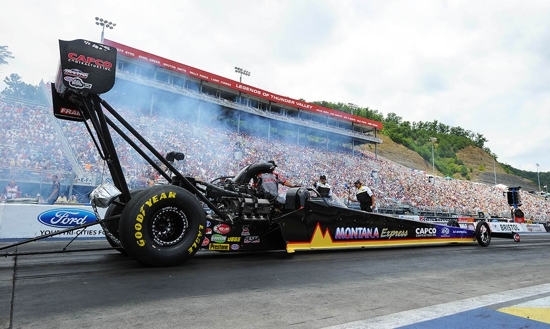 Torrence, driving the Capco Montana Express Top Fuel dragster in a tribute the late John Mitchell, came up on the short end of a close race against Clay Millican. The winning numbers were 3.881 seconds at 312.78 mph to Torrence’s 3.889 317.79 mph. He had won two of the last three races (Atlanta and Englishtown, N.J.) but this outcome illustrates how close the competition is in the 2012 Full Throttle series. If more proof is necessary, Torrence was able to move from fifth into fourth place in points with 679. That put him 12 head of Morgan Lucas, who did not qualify. The team’s next stop is Joliet, Ill., site of the O’Reilly Route 66 NHRA Nationals, June 28-July 1.